The rotary broach brake is used to align forms when rotary broaching. 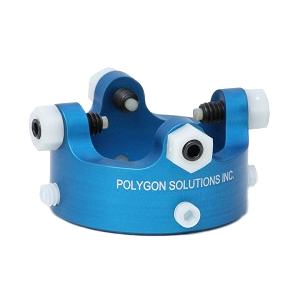 Polygon Solutions Inc. designed the broaching brake to be used as an attachment to its innovative GT Series rotary broach holder. The brake mounts to the tool holder using set screws. Additional screws are included at the opening of the brake to gently tighten against the spindle. The broach is fastened into the spindle, and must make contact and be aligned at the first hole. When the broach is engaged with the part, the brake is loose enough to allow the spindle to turn without interfering with the broaching operation. 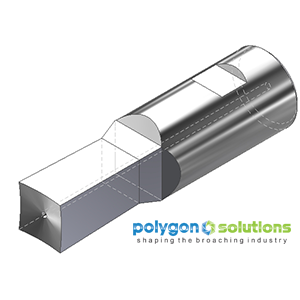 Unlike typical rotary broaching operations, turning must stop before removing the broach. When the broach is removed, the brake screws are tight enough to hold the broach’s position until it makes contact with the part at the next hole. The rotary broaching brake can be used to hold orientation for single or multiple parts. Tightening the screw to be loose enough to allow broaching, but tight enough to hold orientation requires patience and a level of experience. Some trial and error can be expected and the broach orientation will need to be checked at regular intervals. 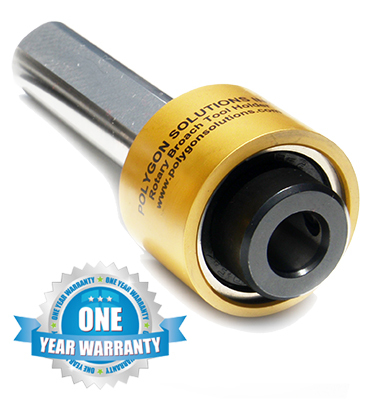 The hardware consists of standard screws and nuts that can be replaced or reordered easily. SKU: BR-163-B. Category: Rotary Broach Tool Holders.